Nourishes scalp, strengthens and prevents hair loss! NOVUHAIR® TOPICAL SCALP LOTION is recommended to men and women, 12 years old and above, who are experiencing excessive hair loss, hair thinning and bald patches, those who want to stimulate hair growth, those who are looking for a natural alternative solution to prevent dandruff and scalp itchiness and to those who are in need of cleansing and detoxification. The use of a mild herbal shampoo is strongly suggested to wash and prepare the hair and scalp prior to the application of the Topical Scalp Lotion. NOVUHAIR® 2-IN-1 PACK is recommended to men and women, 12 years old and above, who are experiencing excessive hair loss, hair thinning and bald patches, those who want to regain hair luster and vibrancy, stimulate hair growth, those who are looking for a natural alternative solution to prevent dandruff and scalp itchiness and to those who are in need of cleansing and detoxification. 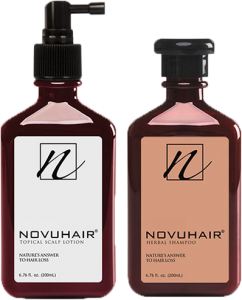 NOVUHAIR® 2-IN-1 PACK contains one 200mL. bottle each of the Topical Scalp Lotion and Herbal Shampoo. NOVUHAIR® Herbal Shampoo has been specially developed to prepare your scalp in an optimal way for the application of NOVUHAIR® Topical Scalp Lotion to enhance its effect and bring back the vibrance and luster of your hair. NOVUHAIR® 3-IN-1 PACK is highly recommended to men and women sporting long hair, 12 years old and above, who are experiencing excessive hair loss, hair thinning and bald patches, those who want to regain hair luster and vibrancy, stimulate hair growth, those who are looking for a natural alternative solution to prevent dandruff and scalp itchiness and to those who are in need of cleansing and detoxification. 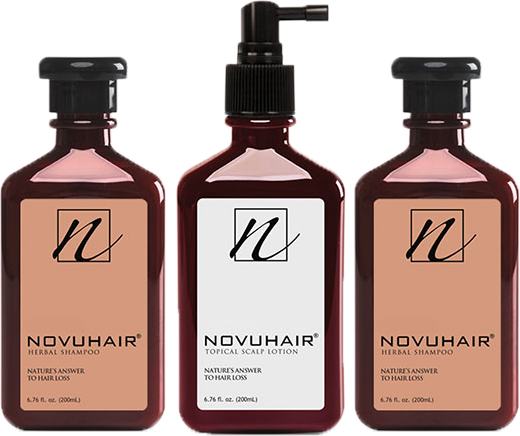 NOVUHAIR® 3-IN-1 PACK contains one 200mL. bottle each of the Topical Scalp Lotion, Herbal Shampoo and Herbal Conditioner. NOVUHAIR® Herbal Conditioner has been formulated specially to complement the use of NOVUHAIR® Topical Scalp Lotion and NOVUHAIR® Herbal Shampoo. Regular use of NOVUHAIR® Herbal Conditioner and NOVUHAIR® Herbal Shampoo helps prepare your scalp for the application of NOVUHAIR® Topical Scalp Lotion in order to maximize its effect, improve the overall cosmetic qualities of your hair, giving it a shinier, softer and supple look. NOVUHAIR® 2-IN-1 PLUS ONE PACK is recommended to men and also women who have enjoyed the full benefits NOVUHAIR® Topical Scalp Lotion and has achieved the desired results yet would want to continue the use of NOVUHAIR® Herbal Shampoo to sustain the effects, 12 years old and above, who are experiencing excessive hair loss, hair thinning and bald patches, those who want to regain hair luster and vibrancy, stimulate hair growth, those who are looking for a natural alternative solution to prevent dandruff and scalp itchiness and to those who are in need of cleansing and detoxification. NOVUHAIR® 2-IN-1 PLUS ONE PACK contains one (1) 200mL. bottle of Topical Scalp Lotion and two (1) 200mL. 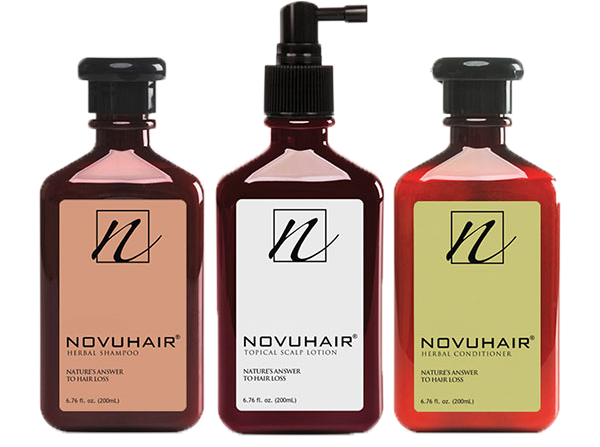 bottles of NOVUHAIR® Herbal Shampoo. NOVUHAIR® Herbal Shampoo has been specially developed to prepare your scalp in an optimal way for the application of NOVUHAIR® Topical Scalp Lotion to enhance its effect and bring back the vibrance and luster of your hair.